The charter is already reaching international audiences too. The PDA Union represents UK pharmacists in EPhEU (European Association of Employed community Pharmacists in Europe) who have been advising the pharmacists in Poland on establishing their own trade union. 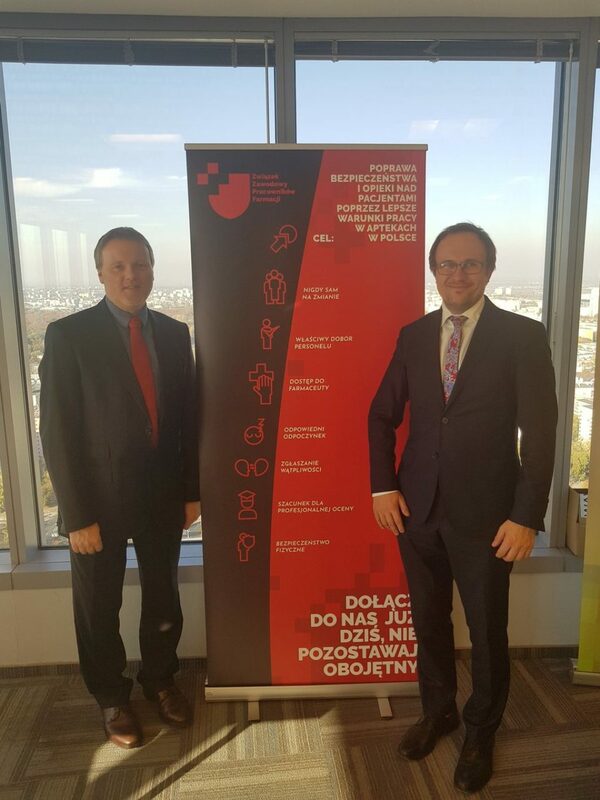 At the 2018 EPhEU General Assembly held in Warsaw on 16 – 17 October we were delighted to be present along with the Polish Health Minister and others at the official launch of the Polish Trade Union of Pharmacy Workers – Związek Zawodowy Pracowników Farmacji (ZZPF). 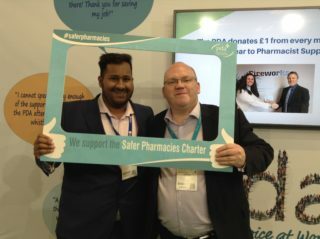 PDA Union are delighted that ZZPF members have adopted the principles of the Safer Pharmacies Charter as core values for their organisation, as can be seen on the banner in this photo. Pictured alongside the banner are Mark Koziol of PDA and Piotr Merks of ZZPF. 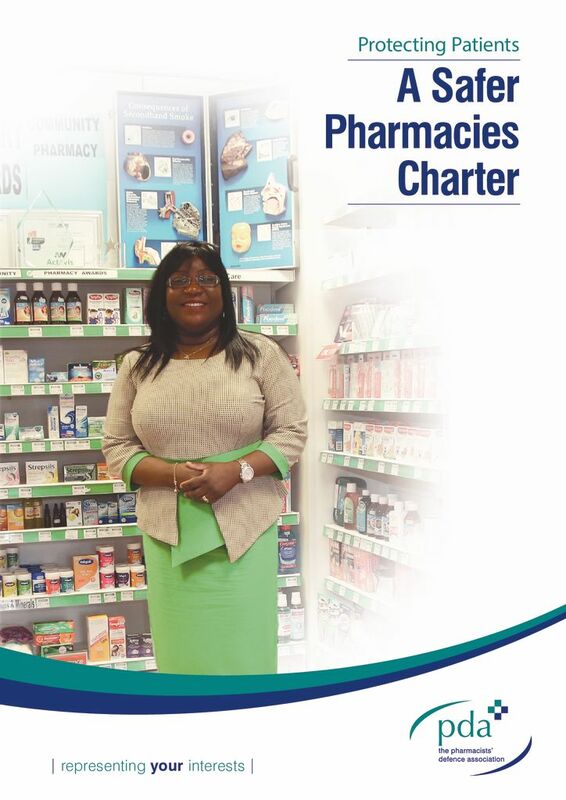 In Wales, a Welsh language and English language version of the charter was recently distributed to every community pharmacy in partnership with Community Pharmacy Wales. We are delighted to work with other organisations that also want to see safer pharmacies. We’ve been advised by the Royal Pharmaceutical Society (RPS) that although they “agree with the PDA on the importance of patient safety and how this is key to the role of every pharmacist.” and understand that “…the PDA’s Safer Pharmacies Charter identifies some important issues” which they say they will consider as part of their work on community pharmacy standards, they will not be formally endorsing the charter. The charter defines basic standards to ensure safe practice wherever pharmacists work and RPS say they want to build on the points included in the charter in discussion with PDA and others as they create their own professional standards. The target date for delivery of the RPS proposals is not yet known and we are disappointed that the professional body for Great Britain’s pharmacists have chosen not to endorse the charter and be part of the campaign we commenced last November. However, we look forward to seeing the eventual outcome of the RPS activity, along with any contributions to patient safety from any other bodies. We will continue to focus on working with those who will support our campaign including other trade unions, patient safety organisations and of course most importantly pharmacists themselves. 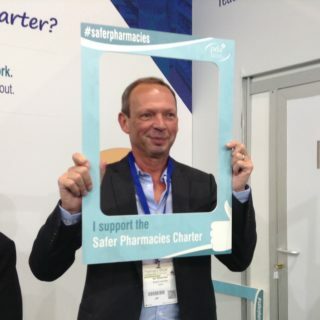 For more information and to support the Safer Pharmacies Charter, click here.